The 67-year-old singer has penned an emotional tribute to the Status Quo guitarist, who sadly passed away in hospital in Spain on Christmas Eve (24.12.16) as a result of severe infection following complications from a shoulder injury, at the age of 68. The 'Whatever You Want' hitmaker has been finding it hard to come to terms with the loss of his dear friend and musical sidekick - who he has worked alongside since 1967 - but broke his silence by releasing a statement honouring the career and life of the music legend on Monday (26.12.16). He said: "I was not ready for this. 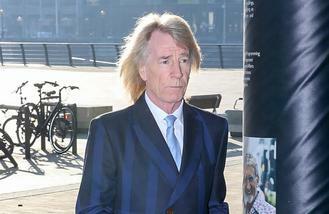 "Rick Parfitt had been a part of my story for 50 years. Without doubt the longest relationship of my life: this was also the most satisfying, frustrating, creative and fluid. From those early days, we worked together to create the Quo sound, look and hits. We spent years on the road, on the stage and in the studio, rarely far from each other, honing what we did. And with all of the rock stars lost in 2016, including David Bowie, Prince and most recently George Michael, Rossi says Parfitt still "stands out" as one of the greats. He also goes on to talk about how losing him was still a great "shock" despite his wild past, which saw him experiment heavily with drugs and alcohol. He added: "Rick was the archetypal rock star, one of the originals, he never lost his joy, his mischievous edge and his penchant for living life at high speed, high volume, high risk. His life was never boring, he was louder and faster and more carefree than the rest of us. "There were any number of incidents along the way, times when he strayed into areas of true danger and yet still losing him now is still a shock. Even in a year that has claimed so many of our best, including now George Michael, Rick Parfitt stands out. I was not ready for this." Earlier this year, Rick - who suffered his third heart attack and spent several days in a coma after a gig in Turkey in June - admitted he was terrified of dropping dead on stage. He said: "I'm just aware of the nervousness I get before I go on stage. It does pump your heart slightly when you start to pace up and down the room, and you're about to go in front of thousands of people. Obviously it's going to have some effect on you. "I do not want to tax myself in any way. I've been told medically not to. So whether it's a full gig or a cameo I'd still get fairly nervous and I do not want to get out on stage and drop dead in front of the fans. I do not want to do that." Rick said his latest heart attack has been a "reality check" and he subsequently quit drinking and smoking.